If you want to motivate your players, clients, friends or competitors, you damn well better practice what you coach. If the example set lacks resolve, your reputation will slip like a greased pig down a waterslide. Give us more Vincent Russo, a young football coach and physique competitor, an athlete and bodybuilder! Vinny leads from the front. His training regimen is solid as stone; it's a well-thought-out amalgam of the knowledge he gained through relentless research and trial. The great thing about this training regimen is the mixture of complexity and simplicity. The main thing to remember is to increase weight or reps each week, because as Vinny demands: if your challenges don't increase, your effort should! His program slyly slips in dropsets and supersets, rest-pauses, early-morning cardio and high-rep pleasantries sure to shred your stomach to its abdominal core. 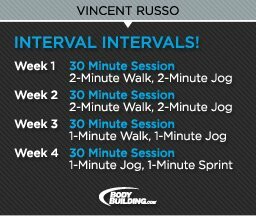 The cardio balances steady-state and interval intensities to shock and awe the metabolism. When you work as hard as this pro-to-be, you'll need to rest your bones! He takes two full days off every week. Sometimes you can't smash through plateaus. "Then basically your body is telling you something," Vinny says. "You might need rest. Even if you don't want to, you gotta take that week off and let your body heal. Give it time, fuel it the right way, then get back to it!" Russo has answers for everything , almost ... He admittedly has "zero" calves and he's upset about it. He trains them like mad, but so far he hasn't figured that one out ... yet! When you go into the weight room, go with purpose! When you need to hit a rep range (8-12), you must fail on each set you attempt in that rep range. If you don't fail, then you're going through the motions and only "warming-up" your muscles. Reaching positive failure ensures that the muscle(s) worked are being subjected to 100% of the potential load each set has to offer. Progressing each week with either weights or reps is important to continue to get better and grow. If you aren't increasing either reps or weight week-by-week, you aren't growing. Increasing the load is the crux of progressive overload, but it is important that you increase the load in small increments to ensure you keep progressing indefinitely and avoid plateaus. One final training tip: pause at peak contraction points! Maximal, or at least good, resistance at the peak contraction point of the movement is crucial. In order to produce muscle growth, you need to recruit as many muscle fibers as possible and stimulate them to grow. Pausing at this point ensures the muscle recruits the most fibers possible and stimulates growth! Keep push/pull body parts separate to keep from overworking! Calves and abs: Alternate every day.